GQA Qualifications: What will they think of next? Smart Glass technology was recently installed at KPMG’s offices in Kuwait. The installation included a number of laminated Smart Glass panels and self-adhesive Smart Film which can be simply retro-fitted to existing glazing. 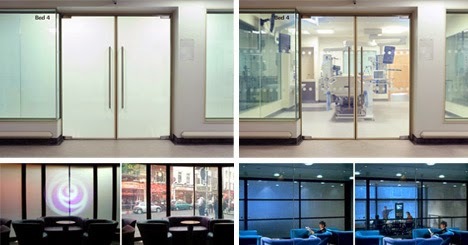 Smart Glass technology transforms any space at the flick of a switch offering instant privacy and security. The product works on an electrical current and when activated switches from clear to opaque. In its opaque state, the product can also be used as a high definition rear projection screen. A little closer to home, when Tesco rolled out their in-store pharmacy services across the UK, customer confidentiality was an obvious concern - Switchable Privacy Glass by Smartglass provided the ideal solution for this project as it grants complete privacy at the flick of a switch. Customers can discuss healthcare issues in complete confidence and privacy in a Smartglass room and still enjoy bright spacious and modern surroundings. Recently GQA CEO Mick Clayton attended a Sheffield Wednesday v Barnsley football match and as a Barnsley supporter may have wished this technology was on the windows of the executive box he was in; if he could have flicked the switch in time he would have been spared from seeing Wednesday’s winning goal in the 7th minute of injury time!